For generations, people in the countryside have kept chickens, mainly for the eggs. Now, more and more people, in town as well as countryside, are enjoying the pleasure of keeping hens in the garden and reaping the reward of those freshly-laid eggs every day. 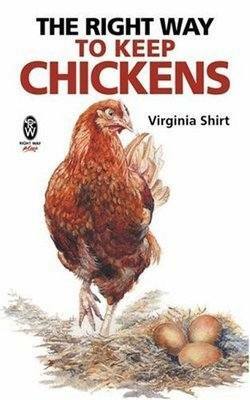 Virginia Shirt has lived with chickens for over 15 years so her knowledge of these fascinating birds is conditioned by practical experience. Her book is a revelation to every aspiring enthusiast. Concentrating initially on the very first steps, like choosing the correct spot in the garden for the coop, the book goes on to deal with feeding and rearing chicks and comprehensively covers matters relating to health and disease all aided by illustrations throughout. Her book is the essential reference tool for every chicken lover. mainly for the eggs. Now, more and more people, in town as well as countryside, are enjoying the pleasure of keeping hens in the garden and reaping the reward of those freshly-laid eggs every day. Virginia Shirt has lived with chickens for over 15 years so her knowledge of these fascinating birds is conditioned by practical experience. Her book is a revelation to every aspiring enthusiast. Concentrating initially on the very first steps, like choosing the correct spot in the garden for the coop, the book goes on to deal with feeding and rearing chicks and comprehensively covers matters relating to health and disease all aided by illustrations throughout. Her book is the essential reference tool for every chicken lover. Virginia Shirt lives on a small farm in Derbyshire and has been keeping chickens for over 15 years. Her love and enthusiasm for these animals is shared in this, her first book, and her hope is that, with her help and a small initial outlay for equipment and so on, anybody can enjoy the fun of having their own chickens and, of course, a regular supply of fresh, nutritious eggs.